Suffering from an overdose of oh-so-serious comics and heavy-handed graphic novels? Fed up with futuristic, pseudo-intellectual nihilism? Fatigued from solemn, autobiographical navel-gazing by artists who, instead of your paying them, probably ought to be paying you, because reading their comics is like having to sit through what amounts to an illustrated version of their psychotherapy? You’re due for a break. 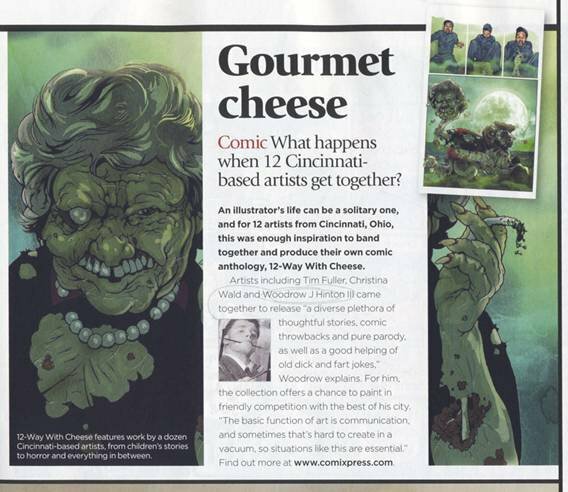 So pick up your copy of Zombie Marge Comix Group’s “Twelve Way with Cheese.” This collaborative book is a labor of love from 12 Cincinnati-based artists (that’s right: Cincinnati—the nation’s rising new comics capital; you heard it here, first). If you grew up with, or otherwise appreciate, any or all of: horror or zombie comics (from EC and its imitators), Mad (and/or Cracked) Magazine, or those funny-books—packed half-a-dozen to the plastic baggie on the spinning rack in the grocery, with thick outlines and dialogue whose only punctuation is exclamation marks—you’ll experience an unmistakable feeling of nostalgia reading this book. Your Cincinnati artist friends pay affectionate tribute to these genres (down to the pulpy ads for those novelty items pandering to your glacially advancing puberty and desperate longing to “apparently” see through women’s clothes) each in his or her fashion. And all of them—mercifully—even know how to draw. Here's my take on the first Cincinnati Comic Expo that took place on September 18th at the Cintas Center. I am in agreement with Tim that the Con was well run and heavily attended especially for being the inaugural event. * Lots of "Twelve Way" Mojo!- We had a steady stream of folks coming up to our spot. Our table with it's banner and poster was way eye catching. I felt a little bad for all the kids that approached our booth as we couldn't sell them, or even let them page through the "Twelve Way" anthology. So I drew a whole bunch of sketches for the kiddies. I'm just like Santa at times! * St. Larriby Perplexing at First - The St. Larriby Holy Cards were a stroke of genius. Thanks Tim! Initially some people were a little confused and thought St. L was an actual entity! 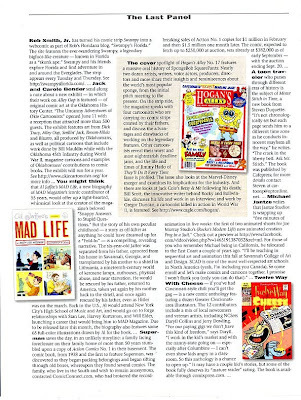 I must have explained about 50 times that, "We decided the cartooning profession needed a patron saint too. And since the Pope is in no hurry to decree one for us, we decided to create one for ourselves." People had a good laugh and a freebie with info on how to order our book. * What Were We Thinking? 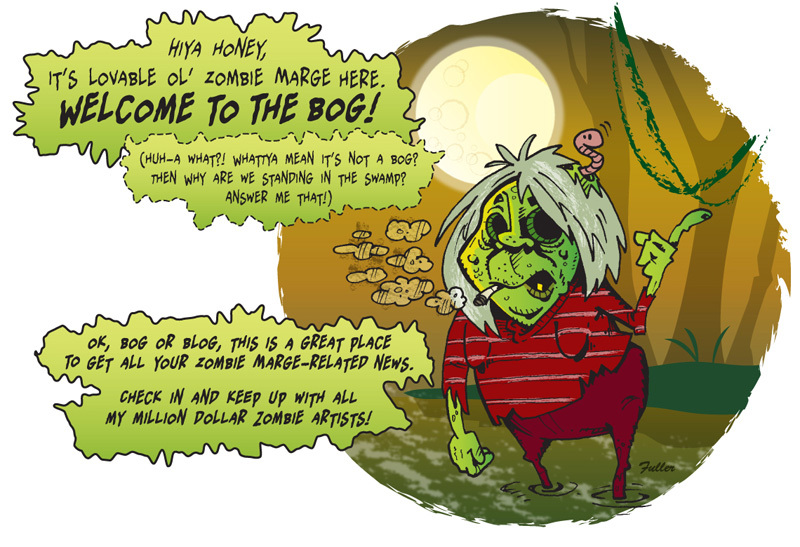 - We could have sold a whole bunch of Zombie Marge T-shirts. We had Mike Dougherty of Anything Airbrushed print up a few for us to wear at the Con. But we should have had a batch for sale as we had many inquiries about the shirts. * Tough Economy/Money Is Tight - Although we sold more copies of "Twelve Way" than I thought we would, even the reduced $15 price point was more than a lot of folks were willing to spend. If you are a known talent in the comics industry or have characters that are easily recognisable, people would be more willing to part with $15 for a book. But I think coming out of the box as a new entity, it was beyond what some people were willing to spend. The original $20 price would have been totally out of the question. A good price point would have been in the $5 to $10 range. Of course that would have meant a smaller page count book. * Comic Expo Charity - The organizers of the Con had a charity auction and requested Superman related artwork or a donation of a comic/book from those who had booths at the show. I had some time on Thursday before the Expo to create this bogus Superman vs. Zombie Marge comic book cover. The original is in B&W. The winning bid and original art going to our own Bruce Chrislip. I'm glad this artwork found a proper home! * Faces In The Crowd - Along with Bruce, other "Twelve Way" contributors seen in the crowd at the Cincy Comic Expo were Jerry Dowling, Brennan Bradford, Brian Hagen and of course the irrepressable Woody Hinton and his lovely wife Lisa. And our invaluable proofreader, Dale Trush. 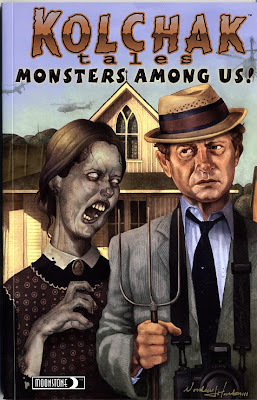 * Speaking of Woody - I finally got my hands on those "Kolchak" comics from Moonstone that feature awesome cover art from Mr. Woody. Cool and creepy! They were personally signed with "heartfelt expressions". Thanks Woody! * Check These Out!- I also got these two fantastic prints from David Beck. I dig 'em! 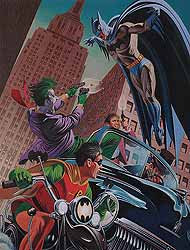 Check out the layout on that Batman illustration. I've never seen Batman striking in that pose before. 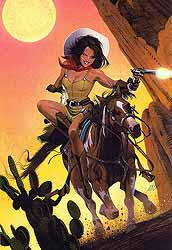 And the Belle Starr is fetchingly awesome. What great color! * I Love Me Some Wacky-Assed Comics! - Check out these gems I scored from comic dealers. I go for the "off the beaten track" titles. There has been some really crazy stuff printed over the years. Ooohhh... Big Boy meets a fortune teller! I think there is a witch doctor in this issue as well. How else do you explain Big Boy's shrunken head??? 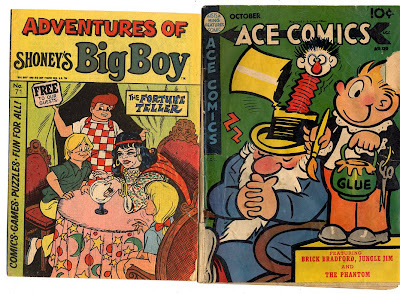 Check out that bold, bold linework on the cover of Ace Comics. Cool! This issue features kids getting spanked and electricuted. Ah... the good old days when you could just be funny and not have to worry about lawsuits or offending the hyper-sensitive. I swear if I could go back in time right now to let's say... 1973, I would! Here's a little advice for any of you who might happen to be in a canoe that's about to go through rough waters, "Do something more than just covering your face!" That kid deserves whatever happens to him. 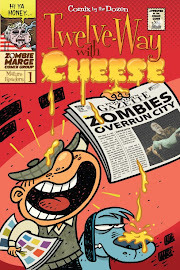 But given that this is an issue of Treasure Chest, a Catholic grade school comic, I bet St. Larriby will bail him out! 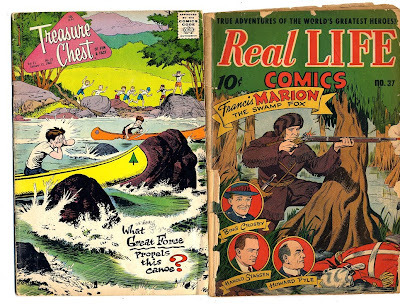 Real Life Comics with Francis Marion and... Bing Crosby! Yow! Check out the head on that Super Villian! And here's a Daryll fun fact... 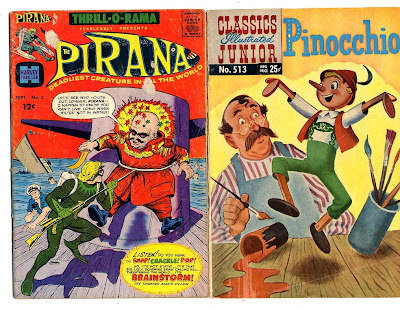 I have been trying to track down this Classics Illustrated Pinocchio comic for years! It was part of the most horrible collection of comics I ever received. I was sick and asked my mom to buy me some comics while she was at the drug store. Big mistake. When my mom came home she walked into my bedroom and handed me my bag of "goodies". And what did little Daryll find? A copy of "Superman's Girlfriend, Lois Lane", the aformentioned "Pinocchio", which was not the Disney version, so in my mind it double- sucked and if I'm not mistaken, a Casper comic! Are you kidding me? It's bad enough I'm all feverish and pukey, but you bring home this collection of comics for your son? I guess the drug store was sold out of issues of Millie The Model and Hazel. Gotta love Mom, but leave the comic buying when you're sick to Dad! 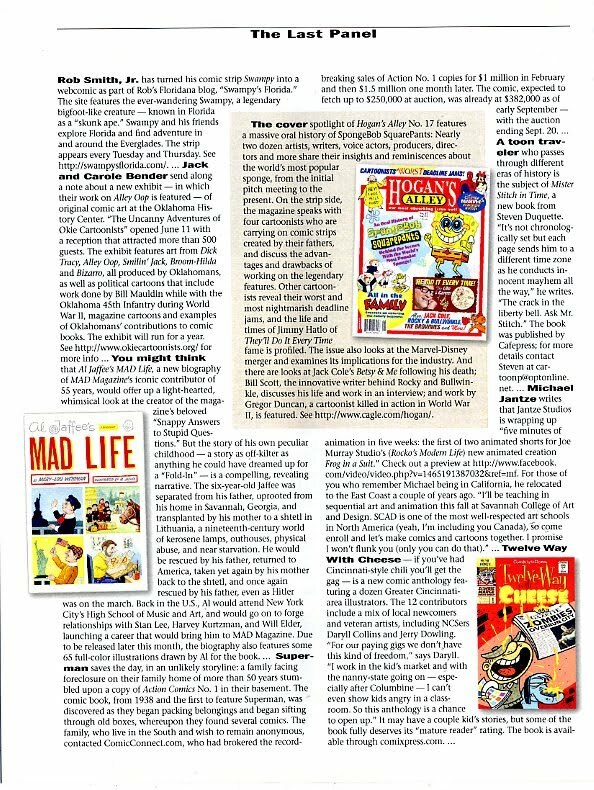 The Anthology 12-Way With Cheese was put in a little spotlight in the UK's Imagine FX magazine, along with our buddy Woodrow Hinton! 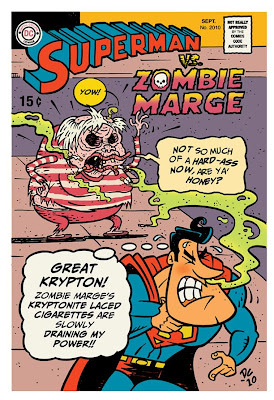 "There is the charming Zombie Marge, lovable Little Lulu as Little Voodoo, a campy look at local self-styled “superhero” ShadowHare and Sports Illustrated swimsuit models as zombies..."
In 1972, I sat on a bus for 14 hours to attend my first comic convention in New York City. 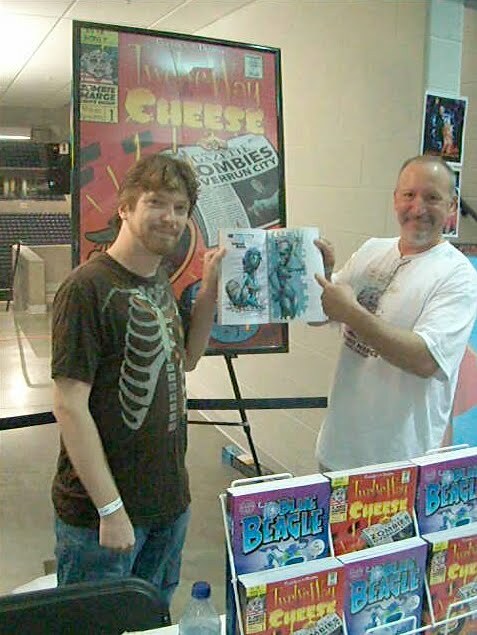 It was a hugely influential event that shaped my choices for many years and fired my desire to write and draw my own comics. 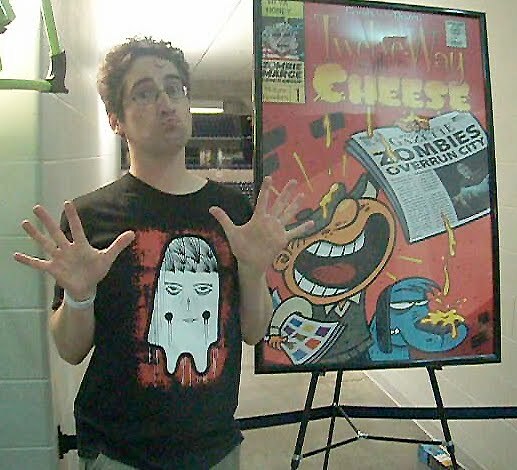 The changes since that first convention, both to the comics industry and to culture in general, have been staggering. 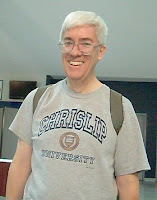 I approached the Cincinnati convention with much the same excitement. For the first time I would be sitting behind a dealer’s table, selling “Twelve-Way with Cheese” and “The Blue Beagle.” Daryll Collins and I arrived at the designated 7 a.m. set-up, arranged our table, and sat, surrounded by empty tables in a nearly empty hall. It was not until the half-hour before the doors were opened to the public that the hall came alive with comic dealers rushing to get their books in place before the crowds poured in. First lesson learned: Don’t get there so early; sleep in. 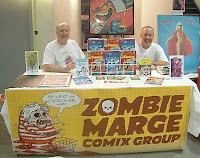 The Zombie Marge Comic Group table drew much interest. People approached with a mixture of uncertainty and apprehension. There was genuine confusion in their eyes when we offered them a free Saint Larriby Holy Card with the ComiXpress ordering information on the back. It was only when they “got” the joke that they warmed up to our pitch. Saint Larriby was a great conversation starter. Even if they walked away without a copy of “Twelve-Way,” the holy card would remind them of the ordering website once they realized the error of their ways. Second lesson learned: Always have a freebie for people to take away. Daryll and I were kept busy most of the day, doing sketches, signing books and joking with the most interesting cross-section of humanity I have ever witnessed. We spoke at length to a heavily tattooed vampire girl wearing a vinyl Batgirl mask. (At least I assume she was a vampire. She had her very own ceramic fangs.) As soon as she found out that “Twelve-Way” featured zombies, she browbeat her boyfriend into buying her one. Third lesson learned: Zombies are good. It was fun to see the kid’s eyes light up when they saw my Cap’n Catnip portfolio with work in progress. But it was disappointing to have to tell the parents that my stories were not really aimed at children. Note to self: Do an all-ages comic, for crying out loud! Have something for the kiddies. 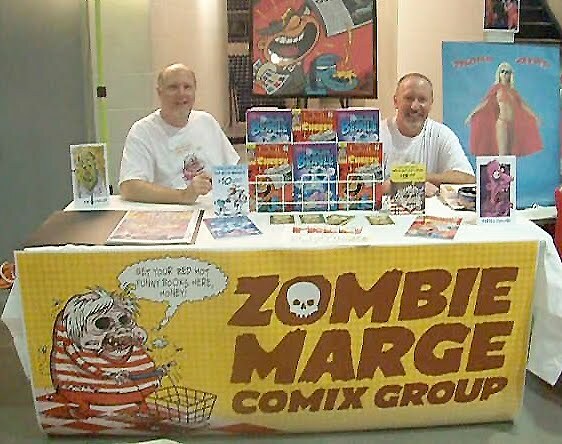 Daryll and I wore our brand spankin’ new Zombie Marge shirt, courtesy of Mike Dougherty, and quickly realized that we could have easily sold quite a few of them. Note to self: Next time, have some shirts. I wish I could include a report on the convention activities, but we didn’t get to attend any of them. The convention was very well organized, seemed to run smoothly and on time, was very well attended and well worth our time. I was grateful to have Daryll sitting at the table with me. It made the time fly and made the work that much more fun. At the end of the day, we were satisfied with our sales. 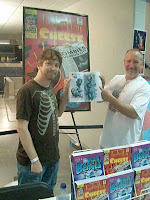 I was personally happy to find that “The Blue Beagle” book sold just as well as “Twelve-Way.” Without a doubt, I will sign up to do this again, as they plan to make the Cincinnati Con an annual event. This was the first of hopefully many more Zombie Marge con appearances.